The ultimate in interchangeable counter top advertising. Our Stock Window Counter Mat allows removable inserts to be easily and quickly updated with the latest advertising or product specials. 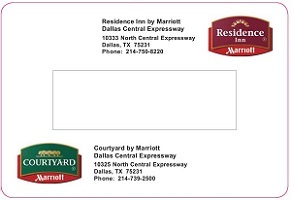 Great for hotel customer service counters or as a hotel room desk pad. It can be easily updated with the latest marketing ads or information sheets, simply by inserting a new graphic. These mats are in-stock and ready to ship. Slide-In Window Counter Mats offer the ultimate in flexibility. 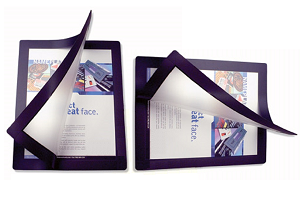 Sealed on three sides, one edge is left open for insertion of ad messages, photos, calendars, sales sheets, posters, or other graphics. These durable counter top pads protect the counter surface, drive impulse purchasing decisions, build on existing promotions, and are an effective, inexpensive way to display your marketing message. Custom window locations available. WindowMats.com is an industry leader in retail and industrial counter mat display solutions. We want to be your counter mat company. Our goal is to provide you with the most innovative designs at the lowest possible cost. We offer custom printed and stock products. Call or email for a discounted price quote. Copyright © 2019 WindowMats.com, A Division of InfoGraphics Information Services, Inc. All rights reserved. WindowMats.com is an industry leader in the sale of interchangeable counter mats and counter top pad poster displays for retail stores. All trademarks and patents are the property of their respective owners.